When the friend (Joan Blondell) of an heiress (Carole Landis) is accidentally murdered, her ghost enlists the help of Cosmo Topper (Roland Young) in identifying the killer. 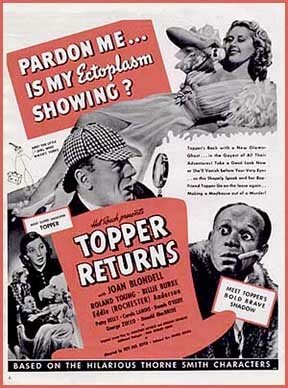 Roy Del Ruth directed this final installment in the inexplicably popular Topper trilogy, which banks on much of what made the first two so successful: plenty of ghostly special effects and tedious slapstick humor. While it’s no masterpiece, the presence of Joan Blondell as the ghost de jeur (replacing Constance Bennett’s “Mrs. Kirby”) adds a much-needed touch of sass and vigor to the proceedings, and the Old Dark House “whodunit” plot at least provides viewers with a welcome narrative hook (I’ll admit the ending caught me by surprise). Best of all: Billie Burke as Cosmo’s airhead wife is given mercifully few scenes! No. As noted previously, the Topper sequels are certainly not must-see viewing — though Blondell makes this one more bearable than its predecessors. First viewing – a tentative once-must, mainly for the performances. I’ve not yet seen the second part of this trilogy but I’d be willing to bet that this film can work as a stand-alone piece; it’s not essential that the viewer understand the basics set-up in the original film (which, as I’ve noted, is of such little substance that it can be skipped altogether). Reading the assessment above, I approached part 3 with some trepidation…so imagine my surprise when I found myself entertained, and more than reasonably so. Del Ruth, as it turns out, is a wonderful choice as director and he has assembled a very game cast; they appear to be enjoying themselves to a considerable degree. Not only is Blondell a plus-factor (she plays off Landis and Young rather well) but we have here a number of effective actors in the supporting cast: Patsy Kelly – who should have been given more to do – Dennis O’Keefe, H.B. Warner, Eddie ‘Rochester’ Anderson, George Zucco, Donald MacBride, and Rafaela Ottiano. Though there are some fun lines in the film’s first half (“Good night, Miss Richards. I hope you rest in peace.”), the second half of the film gets a major lift when the script rises to a funnier and more farcical level.